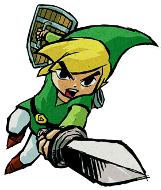 If you are a Zelda fan, you have most likely played The Legend of Zelda: The Wind Waker. The beautiful cel-shaded visuals that made the game famous are just the icing on the cake, for when you truly think about it, The Wind Waker might be one of the best Zelda games overall. The game took a massive step up from Ocarina of Time, Majora’s Mask, and A Link to the Past in terms of storytelling, character development, and other features that make The Wind Waker what it is. Throughout this article, I am going to go through some of the things that make The Wind Waker a dramatic change of style in comparison to the game’s predecessors. One of the things I am going to start with is the overall visual design. A Link to the Past had some sort of artistic look to it, almost like a colorful, 16-bit version of Twilight Princess. Ocarina of Time and Majora’s Mask seemed to be going for a more realistic look, but also appeared to have an anime style in the game’s visuals to compensate for the hardware. The eyes, for example, had an unrealistic sparkle to them. Also, compare the design of the characters on paper to the design of the characters in the game. The game made the low polygons work by having models and textures with smooth lines. Detail seemed to be the name of the game for the 64-bit Zeldas, especially with the competing PlayStation (and when Majora’s Mask came out, the PlayStation 2, which was released the day after in North America) and Sega Dreamcast. However, when The Wind Waker came out, it had to deal with the competition of Microsoft’s Xbox and Sony’s PlayStation 2, one of which the Nintendo 64 had already fought. Cel Shading takes a lot of effort from the system due to a different style of rendering, which shows that the GameCube was competitive with consoles like the Xbox and PS2. In terms of story development, it begins the same as almost every other Zelda game has: a young boy, through a series of events, is thrown into the outside world and has to end up saving Princess Zelda and the world. This Zelda game shows Link with his closest family members that have ever appeared in the series: his sister Aryll, in addition to his grandmother. The only other close family Link has had was featured in A Link to the Past, in which his uncle raised him. How Link has reacted to his changing environments has has also been altered. In Ocarina of Time and Majora’s Mask, Link seemed to roll with the punches, whereas in The Wind Waker, he seemed much more expressive and had a reaction to just about everything that happened to him. Then, we have the well-known Princess Zelda. Just about every other Zelda was fully aware that she bore the Triforce of Wisdom and had the blood of the Royal Family flowing in her veins. 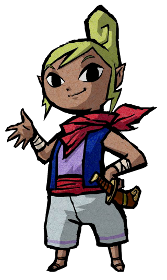 However, although she enjoyed learning about the ancient kingdom of Hyrule, Tetra never suspected that she was a vital part of the forgotten kingdom. Upon seeing the Master Sword on Link’s back, she reacted the same way every Zelda fan reacts to a new game on the horizon: freaking out on the inside, yet trying to keep their cool on the outside. Upon learning that she is a descendant of the Princess of Destiny, she had a total change in character, which resulted in how she responded to Link’s acts of heroism. This makes Tetra seriously stand out in comparison to past Zeldas, who were all princesses since they were born, had known they bore the Triforce of Wisdom, and said “Hallelujah, we’re saved!” upon seeing a hero clad in green with the sword of evil’s bane in hand. However, one significant change was the number of main quest related dungeons there were. If you exclude the mini-dungeons involved with getting the Triforce maps, there are seven dungeons, one of which you revisit. This is a major step down from A Link to the Past, which had 12, and Ocarina of Time, which had 11. However, it is the mini-dungeons in Wind Waker that truly encourage exploring in The Wind Waker. 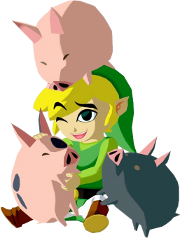 While Ocarina of Time may have only two mini-dungeons and A Link to the Past had even fewer, Wind Waker had countless mini-dungeons that would offer things from treasure charts to heart containers. The mini-dungeons in The Wind Waker varied in length and could be, in some cases, in the most unlikely of places, being either under a tiny rock or in a tiny section behind the island. Another significant difference is the music style. A Link to the Past had mostly upbeat music, even in places like the Dark World. Ocarina of Time had a worldly style, with a Caribbean music for the Zoras, a Latin style for the Gerudos, Renaissance for the Hylians, and the list goes on. The Wind Waker had a vastly different tone, mainly featuring an Irish, seafaring style. This is evident in the extensive use of grace notes, which are those quick little flutters you hear. The violin and flute are used together, which is common in Irish folk music. I am not stereotyping Ireland and its older music styles, but that is how some types of their folk music go. However, this whole set of differences may still keep this title similar to the other games in the Legend of Zelda series. Players feared that The Wind Waker made overly drastic changes, whereas, in fact, it keeps it very, very close to the series. Perhaps the same could be said about Skyward Sword, which has been said to take a dramatic turn from all titles in the series. The more recent games seem to be making additions and amendments to the timeline that we all have come to know and love, with Wind Waker and Skyward Sword being no exception. Wind Waker also goes to the roots of the older Zelda titles and has Link risk life and limb in order to save Zelda, and that will hopefully be the case for Skyward Sword. In addition, all of the Zelda games, especially Wind Waker, encourage the players to go out and look for hidden grottoes and caves where items and game changing things can be found. Most importantly, they are all important chapters in the legend of Zelda.